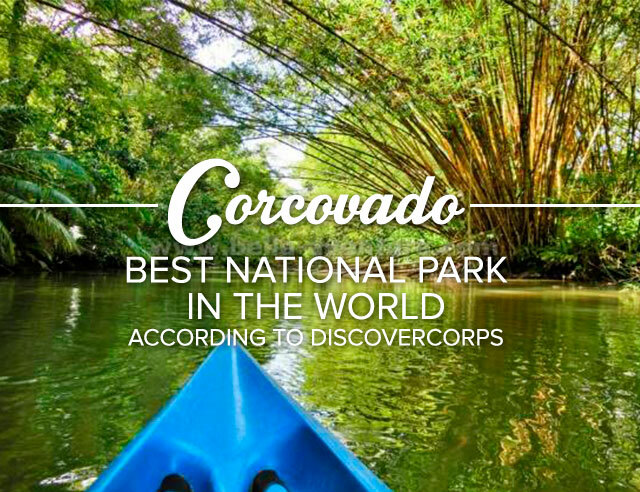 Ask pretty much anyone that has visited Costa Rica what their favorite meal was and 9 times out of 10 you’ll probably hear “gallo pinto” (and the 10th is lying). 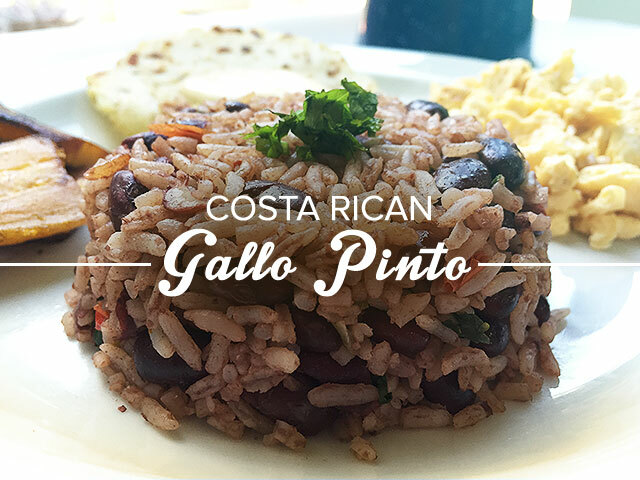 Dubbed the unofficially official dish of Costa Rica, Gallo Pinto is a surprisingly simple mixture of beans and rice, but when made right, the flavors will take you right back to that little café on the beach or cozy restaurant in the rainforest where you first tried it. 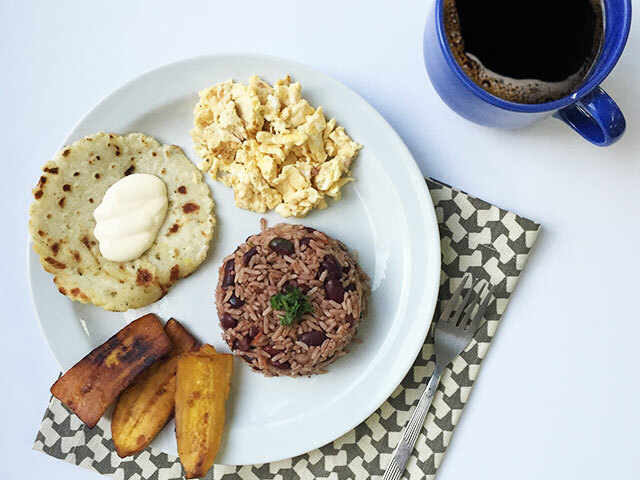 Gallo pinto can be eaten at any time of day at any meal but is typically a breakfast staple, served alongside eggs (we prefer scrambled), tortilla, fried plantains, and natilla (our version of sour cream but a little bit creamier with a sweet aftertaste). 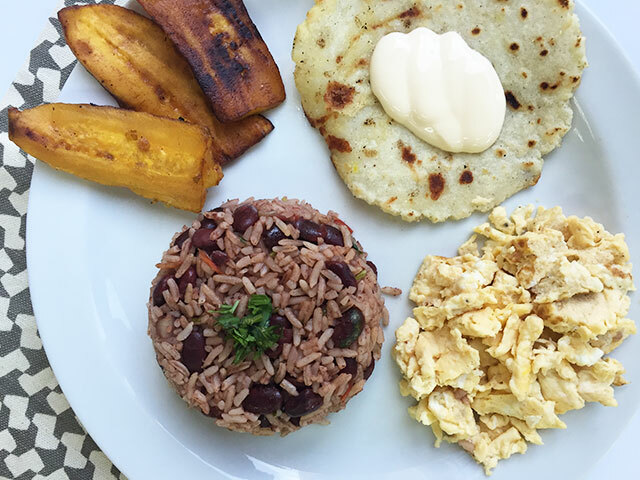 Gallo pinto can be made in a variety of ways, usually with families adding their own secret ingredient that gives it that little something extra. For our recipe, we stuck to the basics, but as every tico (local Costa Rican) would tell you, the ultimate ‘secret’ is the Lizano Sauce. Thankfully, this can be substituted with Worcestershire sauce for those that don’t have access to Lizano, but true to our country, we would say that nothing rivals the real Salsa Lizano. 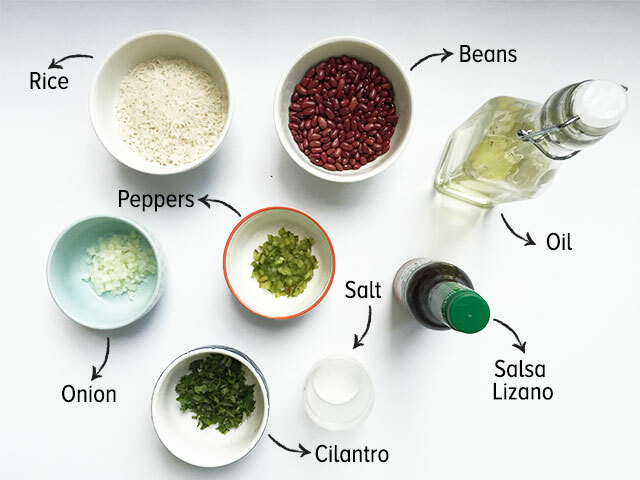 *If you don’t want to mess with cooking the beans, you can use a 15 oz can of black beans (rinsed and drained) instead. 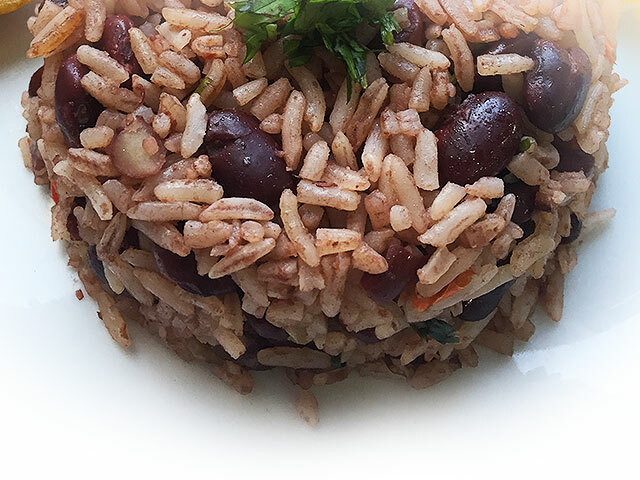 Also add 4 tablespoons of water to avoid the gallo pinto becoming too dry. **1 cup of uncooked rice yields approximately 3 cups of cooked rice. If you’re making the rice the same day, put it in the refrigerator after it cools to help it “age” a bit, which will allow it to mix well with the other ingredients. We recommend cooking it the night before though and storing in the fridge overnight. Place the 2 cups of uncooked beans in a pot, cover with water and let them soak overnight. The next morning, drain the water and then add fresh water an inch above the top of the beans and bring to a boil. Cover the pan and reduce the heat to a very low simmer until beans are soft. This could take up to 3 hours or longer. 1. In a hot pan, melt the butter and add the onions, season with a pinch of salt and then add the red bell pepper and the cilantro. 2. Stir in beans and the teaspoon of oil, adding the Worcestershire sauce and salt to taste. 3. Finally add the rice and stir well until all ingredients are well blended. 4. Let stand for 3 minutes over medium heat, stirring occasionally. 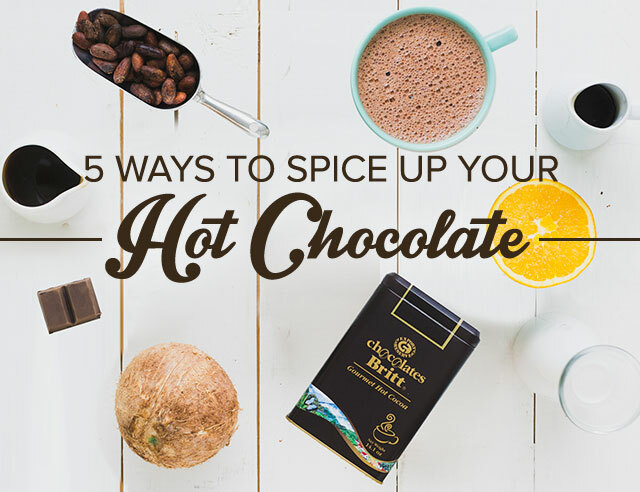 Comment below and let us know if you try the recipe!